Non-insertive acupuncture is the cornerstone of my practice because, in my experience, it most effectively targets the root causes, rather than simply treating symptoms. Shakuju Therapy is by far the most effective form of acupuncture I have encountered in my 14 years of experience, and is the foundation of all my treatments. I also provide traditional insertive acupuncture, health coaching, and other complementary therapies to enhance the effects of non-insertive acupuncture treatments. While non-insertive acupuncture is my specialty, I also perform traditional acupuncture. What is traditional insertive acupuncture? The most obvious difference between insertive and non-insertive acupuncture is that the insertive style actually penetrates the skin. This is the type of treatment most people associate with acupuncture. 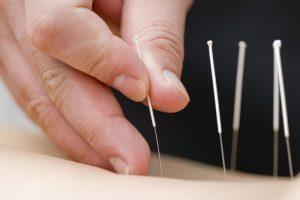 Traditional acupuncture uses hair-thin needles that break the skin in order to stimulate strategic points on the body. Its goal is the same as its non-insertive counterpart: to redirect energy flow and restore balance. Check out the acupuncture FAQ section here to learn more.